Description: First the pics are from their website I did not take these, but I would say they are very accurate. This is a nice park. We spent 3 nights here with our grand kids, they had a great time. Park is located between I-44 and I-35 in Oklahoma City. There is some highway noise in the background when you are outside but we did not hear any while inside the coach. The park is also very close to many attractions. The place looks to be very well maintained although there are permanent residents the normal lawn stuff. Everyone we encountered was extremely helpful and friendly. We would stay there again. 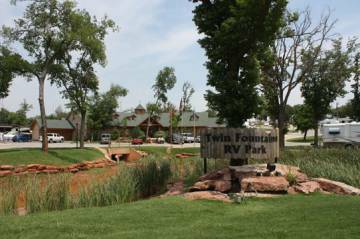 We spent 10 days at this RV park and were beyond IMPRESSED with the park and service. There is a pizza chain inside the enormous camp store/recreation building, the ice was less expensive than at the local gas station. The pool is very large for a campground and very well maintained. The entire park is clean and well taken care of! Some semi-permanent sites around the perimeter and then lots of vacationers/travelers like us. They are less than 2 miles from the zoo and several museums, and they have a limo that they will use as a free shuttle to take you anywhere within a 3 mile radius of the park. The staff is very friendly and helpful. Trash pickup at your site every day. Bathrooms/shower/laundry room very clean and well maintained. Hot tub in the pool area was great. Inside the rec building is a huge TV, two pool tables, ping-pong tables, 2 foozeball tables, and they had great internet there. There were two young boys who would go every morning to the rec hall with their game systems and sit at a table together playing video games all day. The road noise was very minimal. The 'Yard' space between RVs is larger than most campgrounds we've frequented. Very impressed.